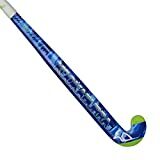 At 29 Acacia Road you will find a hockey stick owned by Bananaman, aging slightly now in 2015 but still keen on hockey, he very kindly allowed us to take his awesome blue and yellow adidas V24 carbon for a review. Control, performance and accuracy is what you get with the adidas V24 carbon and we are very please to review this great hockey stick from adidas. Do not be fooled by the bow position in this hockey stick, the standard adidas 24mm curve is positioned high in the shaft at 300mm up but you get a lot of bend which will give you the power when pushing the ball with the V24 carbon. What a hockey stick with a high shaft like the adidas V24 carbon really offers players is control. Nicely poised over the ball dribbling is smooth and easy. Although you can manipulate your play well enough with lower bows it certainly feels more natural because of the XTREME24 shaft in the adidas V24 carbon. Additional to the shaft shape, dribbling is enhanced using the adidas V24 carbon by the special touch compound on the face of the hockey stick. The abrasive area designed to grip the ball is really great on adidas hockey sticks and is featured on this top of the range V24 carbon. Though dribbling with this stick is one of the most impressive features to review about the adidas V24 carbon hockey stick, control really comes to the fore with passed. The adidas V24 carbon gives you so many options to make accurate controlled passes it’s unbelievable. Push passes we have mentioned already and where I found the adidas V24 carbon really performs amazingly is with slap passes. The long curve of the shaft seems to give you a straighter zone at a hand’s width up from the head from which to keep slap passes under strict control. Combine this shape with the adidas DUAL rod system and high carbon content in the V24 carbon and you have a recipe for success making quick, powerful accurate slap hit passes across field. We can’t end our review of the adidas V24 carbon without mentioning the blue and yellow design. Toned down a little from the more luminous precreation’s I really love the style of the new 2015 version of the V24 carbon. At last we see the adidas blue and yellow design handed to the most creative players on the pitch. If you are reading a review of high bow top of the range hockey sticks then you know what you are looking for already and you won’t be disappointed by the adidas V24 carbon, this hockey stick is one of the best I have had the pleasure to review. It’s powerful, responsive and looks amazing, if you are in the market for a higher bow carbon stick you would do well to arm yourself with the adidas V24 carbon hockey stick. The adidas V24 carbon does come with the XTREME24 shaft despite the listing on the adidas site currently that says it’s a 200mm low bow.